Curd vadai (தயிர் வடை) is generally prepared on festival days as part of the feast menu. 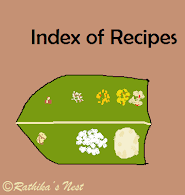 It goes well especially when served along with several mixed rice preparations as on “Aadi 16th” (ஆடிப் பெருக்கு). Curd vadai also makes an excellent snack item and thus, can be included in the party menu as well. Let’s find out how to make this yummy snack. Method: Prepare medhu vadai as per the recipe shared earlier. You may buy kara bhoondhi readily available in the shops. Grind coconut and green chilles into a fine paste. Add the ground paste and salt to the fresh curds; mix well. Soak the vadais in curd mixture. Let it stand for 30 minutes. Spread kara bhoondhi on top. Garnish with coriander and curry leaves. Serve as a snack or part of the feast menu. Note: After removing from the oil, immerse the hot vada in water for a minute or two, before soaking in curds mixture.